It should go without saying that the cloud and the network go hand in hand – one cannot really exist without the other. But what is cloud networking? At its most basic level, it can be defined as running network resources and services – such as virtual switches and routers, firewalls, and management tools – within the cloud. 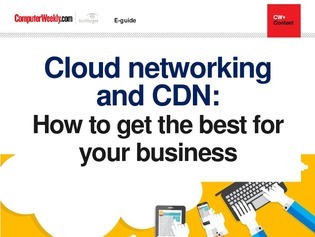 In this e-guide we will be looking at how to bring innovative new software-defined tools to bear on multicloud environments, uncover some of the potential pitfalls of cloud networks and (hopefully) how to avoid them, and take a swing through the related world of content delivery networks (CDNs). First, Christian Annesley looks at the cutting edge intersection of multicloud environments and software-defined wide area networks (SD-WAN). As SD-WAN becomes the go-to option for enterprises managing branch and edge communications to the cloud, this feature explores how SD-WAN fits with multicloud, and looks at some of the questions CIOs should be asking. If you are moving down this road, in our second in-depth look at the world of cloud networks, Peter Ray Allison shares some tips on how to avoid some of the more common pitfalls of migrating to and managing a multicloud network. The benefits of improved flexibility and resilience speak for themselves, but getting it right isn’t a simple process. Finally, Rene Millman explores the current state of the $20bn+ CDN market, and calls on analysts and suppliers to find out how businesses can really soup up their web presence and give themselves an edge over the competition by placing content, quite literally, on the edge.